Four thousand years ago, mankind left Earth. Now a spaceship, Altair CCW-0204, is being sent back home, and Cinecittà World guests have the chance to join the crew. The ride area around Altair looks like a dusty alien landscape, with the ride station being the docking bay for the CCW-0204 spacecraft. The rollercoaster itself simulates the flight back to Earth, with ten inversions which will be familiar to visitors to the UK's Thorpe Park. Altair's layout is a clone (with some minor alterations) of Thorpe's Colossus, which was the first rollercoaster in the world to go upside down ten times. Altair's trains are much more comfortable and open than Thorpe's, with Cinecittà World opting for a lapbar restraint. After ascending the 108 foot tall cable lift hill, Altair's train banks left and enters a vertical loop. 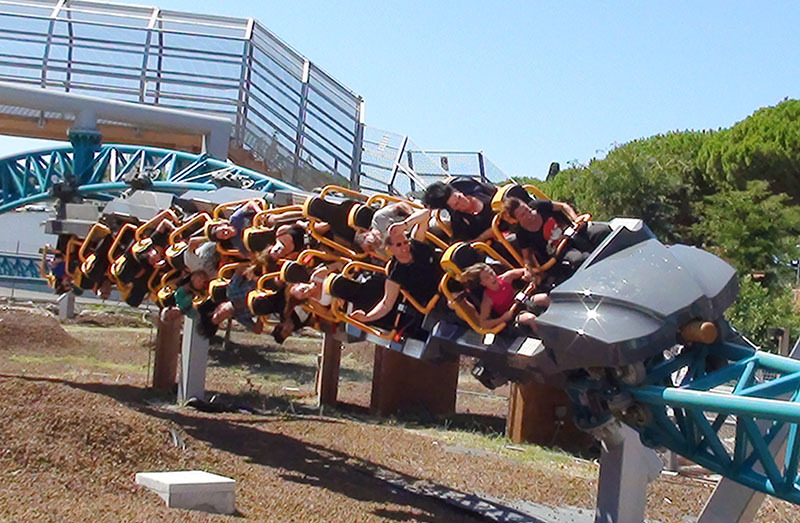 Following an airtime hill, it transitions into the ride's cobra roll before doubling back on itself and running through two corkscrews at the halfway point. Next is a turnaround to line Altair's train up for a quadruple heartline roll. The final inversion is another heartline roll which comes after another turnaround, following which the train hits the brakes and re-enters the rollercoaster's station building. Altair is an impressive rollercoaster, and reminds me of Colossus in its early years before the rattling, headbanging and cramped discomfort ruined the ride. Hopefully it will remain smooth, and the Revision B version of Intamin's Multi Inversion Coaster will prove a much more durable successor to the original.